15:48. Sails in the Desert, Yulara. Our day began bright and early with the alarm at 05:30. We leapt up and gulped down a hurried breakfast of the last Weet-Bix in the house while doing some last minute tidying away of things and taking the rubbish out. Then we packed the last few things and were out the door a couple of minutes after the target time of 05:50. The stars were still out as we walked through the chilly pre-dawn air to the station. A raucous chorus of kookaburras greeted us as we crossed the park from our place. Train tickets to the airport cost $15.20 each - insane really. The train arrived on time at 06:04 and took us across the Bridge in the creeping dawn light, which painted the Harbour blue with a line of pink across the eastern horizon. We changed trains at Central for the airport line and were efficiently whisked away, arriving at the Qantas terminal at 06:45. Having already checked in and printed our boarding passes online, we merely had to drop our bags off. This was, however, complicated by the need for luggage labels for my new suitcase. Normally they have stacks of them at the check-in, but the guy at our desk seemed to have run out and embarked on a jog across the terminal to secure some for us. Luggage labelled, we headed to the security screening, where a long queue of business-suited travellers made their way through efficiently. Through the barrier, Michelle got a coffee and some banana bread for second breakfast. I took a few photos of the terminal, then we wandered a bit, browsing in the luggage store (who on Earth buys luggage at the airport, inside the security area?? ), with M. trying on various sunglasses and then the bookstore. Our flight began boarding early, and there was nobody waiting when we got there, so we went straight on. But soon after, while we were still waiting in the jet tube to get on the plane, a horde of other people arrived behind us. We had seats near the front, in row 8 of the 737-800, because of the early on-line check-in. The plane was chocka and the seats noticeably more cramped than on a 747. Thankfully the flight was only 3:45 long. We had cold sandwiches served for breakfast - mine was ham, tomato, lettuce, and relish, and actually very nice. Last time I had ham on a plane it was disgusting and gristly. M.'s sandwich was cheese and she got an apple too. The movie was Iron Man, which I hadn't seen, and which was pretty good. When it ended, I had to get up to stretch my knee out - I don't think I could have lasted much longer in that seat. Amazingly, the curtain to the first class section had been open the whole flight and people were walking up there to use the toilet at the front of the plane. There were only two people in the section of 12 seats and a lot of empty space, so I lingered and did some leg stretches. No flight attendants came up to usher me back to economy, so I grabbed my small camera and took some photos out the first class windows of the desert terrain passing below. Soon after, we were descending into Ayers Rock Airport, and the people on the left of the plane got what was probably a great view of Uluru, judging by how they were all gaping and blocking the windows. 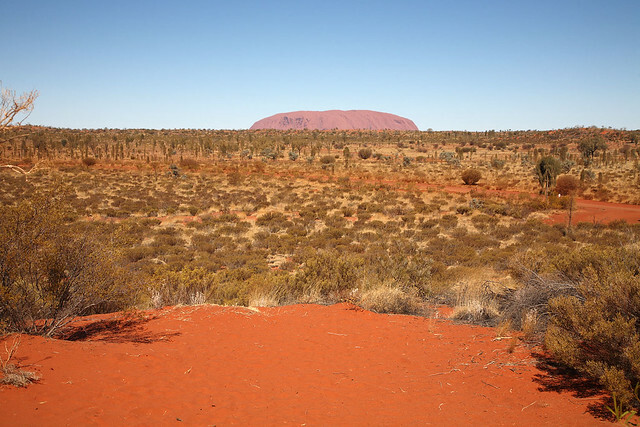 Then we turned for final descent and we got views of Kata Tjuta and then Uluru out the right side before landing on a single strip of tarmac in the middle of scrubby trees sprouting out of ochre red earth. The plane taxied back along the runway itself, there being no parallel taxiway, and we alighted via stairs straight on to the tarmac. We collected our bags, then queued to collect our rental car. There were a lot of French people also collecting cars from the various companies. A young Japanese couple in front of us were told their car was on its way from Alice Springs and wouldn't be here until 5 p.m. (about 5 hours after we landed). We were luckier and got our car right away. When I said M. might drive as well, the guy said he needed to see proof that she was over 25, which M. took as a compliment. When we went out to check the car, we noticed that the rego sticker had peeled right off! We went back into the terminal and interrupted the guy serving the next customers to point this out. He said, "Yeah, the replacement sticker is at Darwin, which is why you're driving it there." He said if we get pulled over, the police can check and find out the car is registered and Avis will get the fine, not us. That sorted, we drove the 6 km to Yulara and our hotel for the next three nights. Our room wasn't available yet, it barely being midday, so we left left our bags and wandered over to the shopping centre nearby to get some lunch. For lunch we got burgers from the Red Rock Burger Bar in the shopping centre. M. got a spinach and ricotta burger with brie and salad, while I got the fried barramundi burger and some chips. M. said the veg burger was excellent, but my barra was not great. 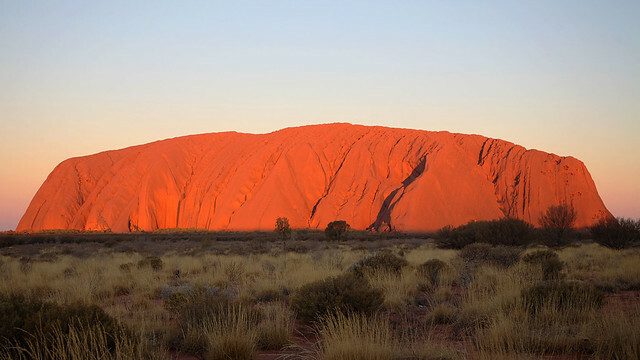 After eating, we walked over to the Uluru-Kata Tjuta National Park Visitor Information Centre to get the local sunrise and set times and the park opening time - vital for tomorrow's sunrise viewing of Uluru. Sunrise today was 07:14, and sunset 18:27. The woman there also said the park opened at 06:30. Then we walked out to the Uluru Lookout on the southern side of Yulara - along the access road a bit and down another road a kilometre or so. The day was bright and sunny with a piercingly blue sky marred only by a few narrow wispy clouds low on the northern horizon. 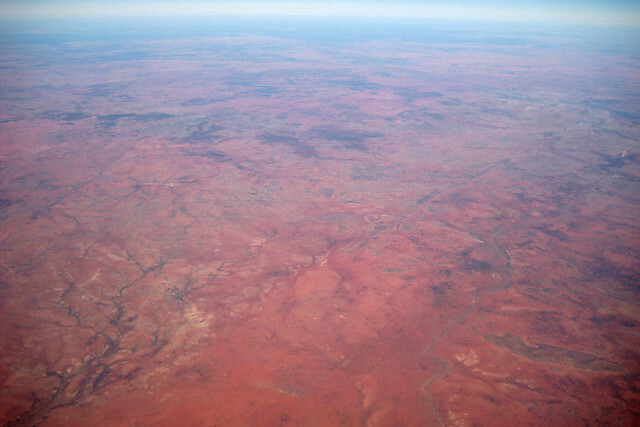 The flat expanse of the desert with its red dirt broken by scrub of spinifex, wattle, and some other scraggly trees stretched to all horizons. 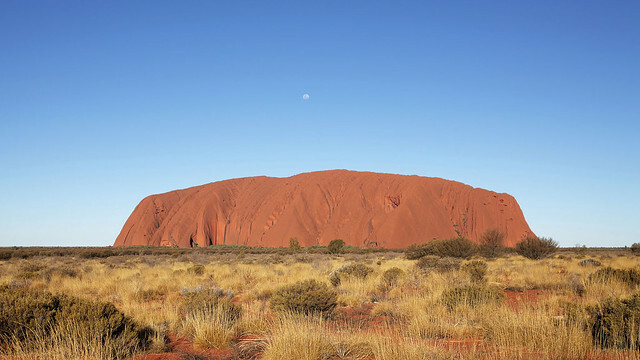 And on the southern horizon loomed the imposing presence of Uluru itself - still some 20 km away, but looking huge already - placed incongruously on the otherwise featureless plain, red and stark against the bright blue sky. And over to the west we could see the rounded humps of Kata Tjuta, further away and not close enough to look truly impressive, but full of promise for a closer encounter. We spent some time in the sun taking photos. 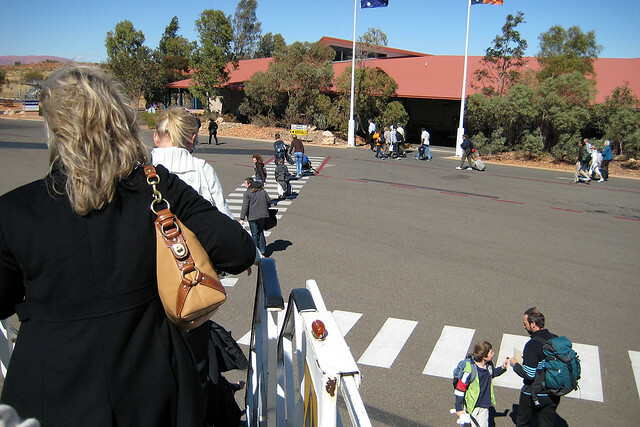 Although the air was chilly, the sun was hot and we were sweating in our jumpers and jackets as we walked back to Yulara. We stopped in at the IGA supermarket to pick up some supplies for tomorrow: apples, pears, muesli bars, and bottles of water. We also got some bread rolls and slices of Swiss cheese to make cheese rolls for snacks. Heading back to the hotel, we got our room key and dumped some stuff and had a bit of a rest before driving out to see the sunset at Uluru. We left at 16:30 for the drive to the viewing position, inside the National Park. At the entrance gate we paid $25 each for 3-day passes. Because we were buying them so late in the day, the three days don't start until tomorrow, which means we can get in again on Sunday morning if we want to catch another sunrise. We nabbed a position by the fence away from any interfering trees and I claimed it by plonking my empty tripod there in the red dirt. As we waited, more cars kept arriving in a non-stop procession. A gaudily painted rental campervan pulled up and disgorged a group of three young travellers, who began setting up a small table with folding seats and then a gas burner for cooking dinner. The guy and two girls had me take photos of the group on each of three separate cameras (point and shoots). Afterwards I struck up a conversation and learnt that the girls were from southern England and the guy was from northern Germany - near Denmark he said. They'd been in Australia for several months each and were now driving their way across the country, having started in Cairns a week or so ago. 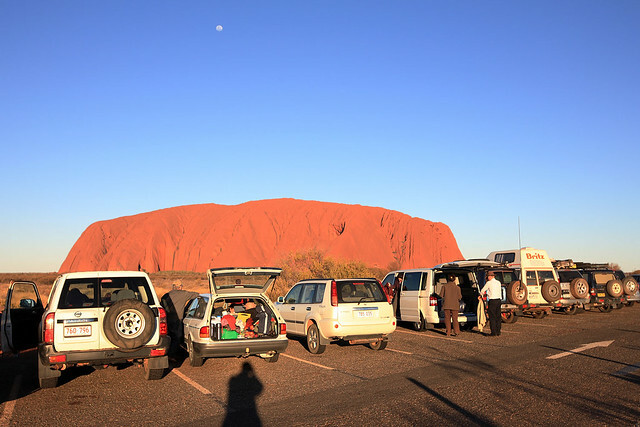 They planned to be in Darwin in two days - just when we're leaving Uluru! I gave them one of my MOO cards and mentioned the 100 Strangers Project, and they were keen to have me take their photos for it. 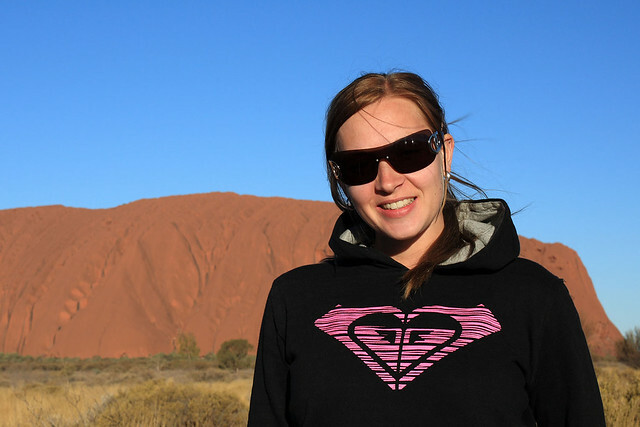 I suspect I may be the first 100 Strangers participant to get shots of people with Uluru in the background! Another van drove up with an Aussie in a bush hat, who began setting up a table with decidedly more posh presentation than the campervan folks' No Frills tuna and pasta sauce - with a white tablecloth, wine glasses, cheeses, meats, and crackers. I thought at first they were just well prepared, but it turned out they guy was a tour guide for an Italian couple who simply sat back and enjoyed the food and the view. A bit later, a German couple had me take photos of them and M. got the woman to take some of us too. Eventually the sun went down and I got some long exposure shots with the tripod and some with the foreground shrubs lit by M. holding the flash to one side. 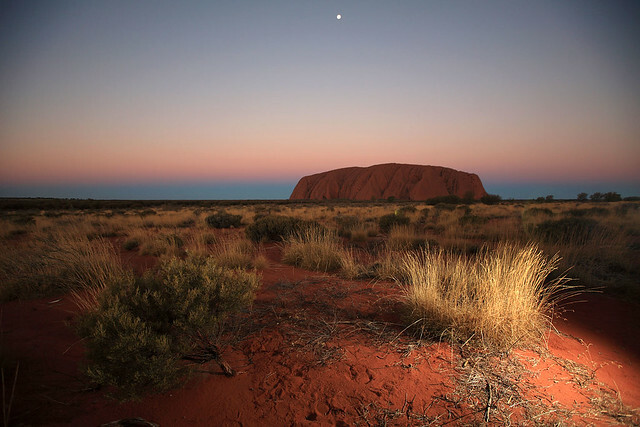 The Rock itself turned a glowing golden orange as the sun crept down to the horizon, then went purplish as the shadows crept over it and the stars slowly came out. We lingered a bit as most of the cars drove away, but it finally became too dark and we followed the convoy back to Yulara. We sought out dinner, first trying the Winkiku seafood buffet in our hotel, but they wouldn't let M. just eat salads for a discount, so we walked across to the Gecko Cafe in the shopping centre. They were busy and we got a table for 20:00, giving us 20 minutes to wait. Rather than just hang around, we went back to the supermarket and bought Weet-Bix and milk for breakfast, now that we knew the room had a mini-fridge in it. We dropped them off in the room then went back to the cafe, which specialised in pizzas and pastas. M. wasn't very hungry and had a tomato soup with bread roll, while I had a decent fettuccine carbonara. Then we came back to the room, exhausted, to shower and get some sleep before our 05:45 start tomorrow. Last updated: Wednesday, 23 January, 2019; 12:57:05 PST.